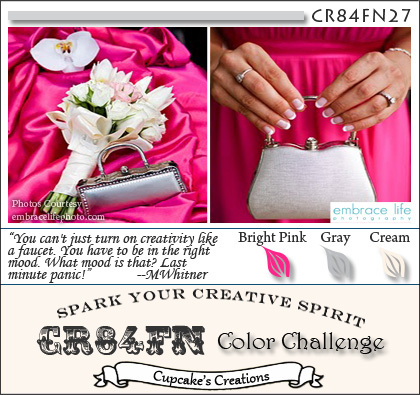 Thanks for stopping by for this weeks CR84FN color challenge! This weeks colors are Bright Pink, Gray and Cream. I took a different approach to this weeks challenge, as I didn't use any stamps! Instead, I let the beautiful papers from GCD Studios do the work for me, just adding my Bright Pink Mulberry Flower embellie! To create my card, I used the Isn't She Lovely Card Template. The template can easily be cut from using the PDF file, however I used the Silhouette to cut mine. I cut the card from Grey card stock, then cut the dress from GCD Studios pattern paper. The Bodice is also cut the GCD pattern paper, added to the dress form with dimensionals, then I added some Ranger Liquid Pearls for texture. I gathered some Tulle and added it just under the bodice with Seam Binding. The Mulberry Flower was color with a Bright Pink Copic Marker. Here's this weeks color inspiration, we'd love for you to play along with us at CR84FN, you can find all the details here on how to enter. If you upload to any online gallery please use keyword CR84FN27 so we can find your creations! Wishing you all a Happy Mother's Day - enjoy your day! I cannot believe that is a CARD!? Simply stunning! It looks like it could be an evening dress for Barbie! GORGEOUS Lisa! Love the dress! So elegant and unique! Love the pop of bright pink! Happy Mother's Day! Lisa - what a wonderful card - it's a work of art!!! I love the embossed texture under the tulle and the very pretty rose!! Gorgeous!! Wishing you a Happy Mother's Day! This is AMAZING, Lisa! LOVE the liquid pearls and the tulle with the seam binding! The tiny rose is so FAB! I'm at a loss for words ~ rare if you know me! 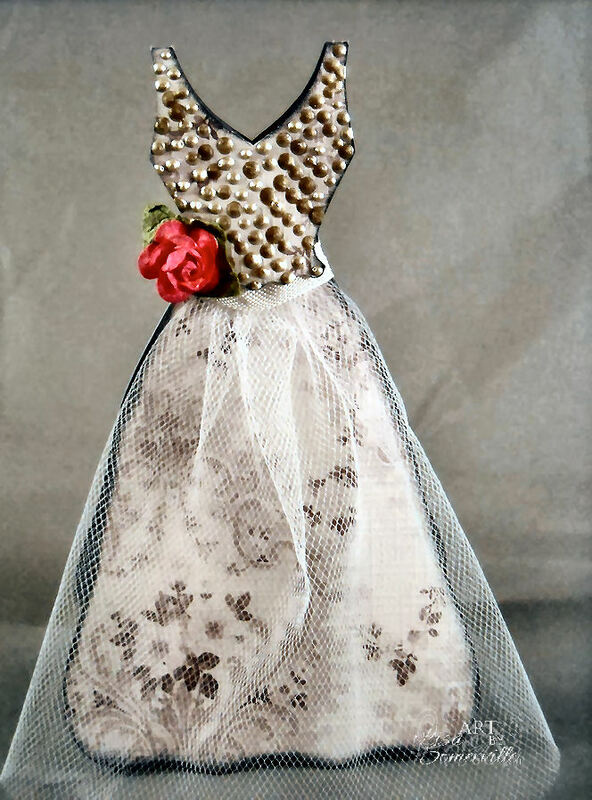 Beautiful, the pearl accents are fab, and the tulle really finishes it off! Your dress took my breath away! It is absolutely stunning! I think I would have to hang it up in my studio or even in my bedroom. So gorgeous! This is so pretty! I love the tulle. And the liquid pearls on the top were a perfect touch! Love this beautiful dress card, Lisa! The liquid pearls make wonderful beads.. the rose is a perfect finishing touch! Totally amazing! 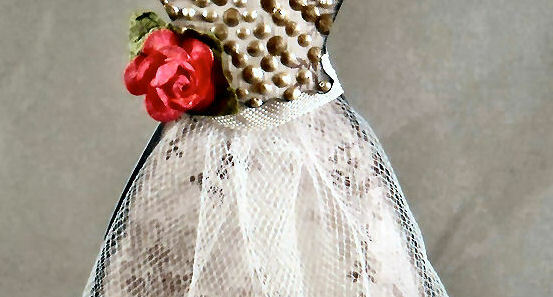 Love that incredible party dress card! The bodice is really something!!! Happy Mother's Day! This is so creative and amazing!! Gorgeous! How fun, Lisa! Beautiful and so very creative. Happy Mother's Day to you, too! Beautiful and elegant dress! Would be beautiful as a Prom invite or as a wedding card. Love the dimensions on the top and the tulle on the bottom! Ohhh, this is so pretty! Great colors for a wedding dress card. Hope you had a great Mother's Day! This is OUTSTANDING Lisa! WOW! Love the bodice of the dress - it would look so pretty as a real dress!!! WOW! Happy Mother's Day! Wow, this is amazing! I'd love a dress like this - especially the skirt :) Beautiful take on the colors this week!